Many people asked me how I came to know about my gall bladder stone. Well, it was found during a medical checkup and the doctor did an ultrasound scan on my abdomen. He told me that I had big stones in my gall bladder. Ok, my fate was sealed...operation was needed. I had to go through a battery of tests before I could be operated on... blood test, ECG, chest x-ray, ultrasound of the lower abdomen. I was also asked a standard set of questions. I need to be hospitalised the night before the operation. At about 8:00AM, 1st Dec 2010, I was asked to put on one of those clothing with opening along the back. A drip was attached to me. Then I needed to lie on the “trolley” to be pushed to the operation theater. I was given an injection at the door to the operation theater and was told that I would feel “blur”. When I was pushed in, I saw the lights above me. I couldn’t remember anything after that until I woke up at 1:00PM. The nurses came very often to offer me pain killer and took my pulse and blood pressure. The lowest pulse rate was 50 upon awakening and this increased gradually. Blood pressure was also very low at the beginning. At one point, the nurse couldn’t even find my pulse! I was later told by doctor in Miri that I was given an injection to relax my muscles. No wonder I was told that a tube would be put through my mouth to help me breathe during the procedure. The whole operation took only 35 minutes. 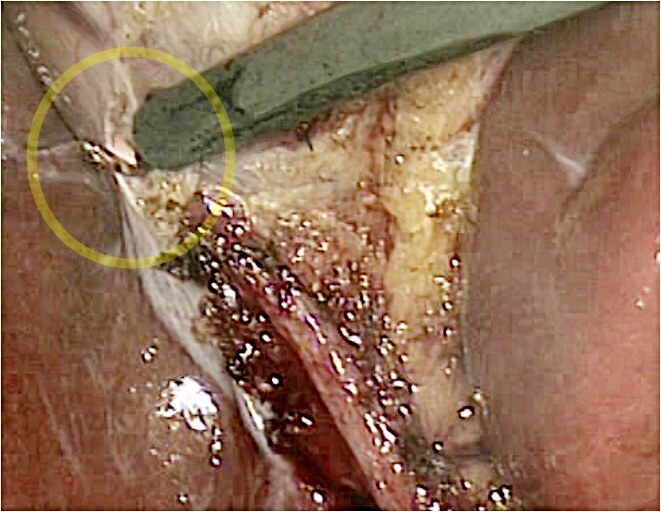 The large stones need to be crushed before it could be removed through the small incision on my belly button. Thanks God that everything went through smoothly. It happened so fast that I didn’t even had time to inform anyone about the timing of the operation. Four keyholes, two about 5mm and one each about 10mm and 15mm were made on me for this procedure. I was told that due to the size of the stones, a major incison would have been made to remove the stone at other hospitals. The gall bladder which was filled with stones. Gall bladder duct was clipped and then snipped. I now have 4 tiny clips in my body. 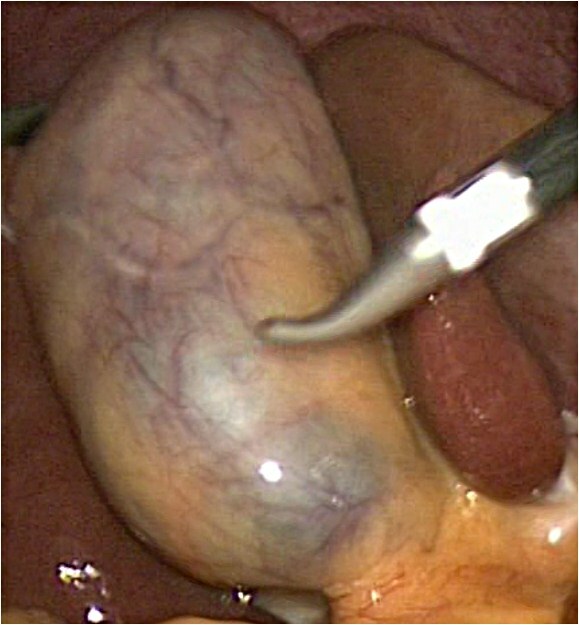 Process of removing the gall bladder which was attached to the liver by membrane and fat. A burning tool was used to remove the tissues (circle) and you can even see the "white sparking flame" at the hook. From the video, I now know one thing... I have too much visceral fat which can cause the blocking of my artery leading to heart attack. I need to do exercise from now on. Footnote: I have no idea why I have gall stone. However, I knew of a few cases, coincidence or not, all of us took calcium suppliment when we were young.﻿ Gall stone can be formed from calcium or cholesterol deposit. At least it was relatively painless eh? I read this earlier and i am sorry I didn't comment coz I felt scared and geli. Today I managed to discard my phobia and look at the photos. I am thankful that you are sharing this awareness with us! Health is so important, more than money!! Tks for sharing. I wonder whether mine has stones. Don't know if you knew this already or not, but calcium needs to be taken with phosphorus and vitamin D together so the body is able to absorb the calcium properly. Check what it says on your calcium supplements, they are usually listed together. Just calcium alone and it reduces the effect, most of it passes through your body and ends up somewhere.. Please verify what I'm writing with the professionals though.